This is a sample article from the January 2013 issue of EEnergy Informer. It is a predictable trend: Falling prices coupled with the growth of installed solar PV capacity. 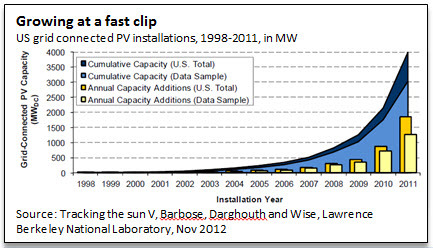 In a report released in Nov 2012, Galen Barbose, Nair Darghouth and Ryan Wise, 3 researchers at Lawrence Berkeley National Laboratory (LBL) document the history of solar PVs in the US from 1998 to 2011, examining small commercial and residential as well as utility-scale installations, which they define as anything larger than 2 MW. While the 4 GW grid-connected PV installation is miniscule compared to US installed capacity, it has been growing at an accelerating clip in the past few years. It is highly concentrated in a few sunny states or states with PV-friendly policies. California accounts for more than half of the residential/commercial and a quarter of the utility-scale installations. 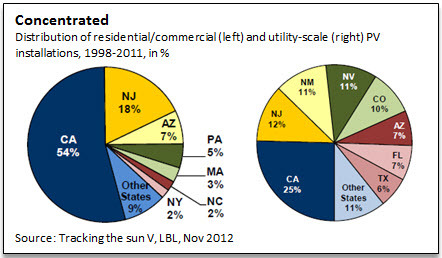 Roughly 90% of utility-scale installations are in 7 sunny states and not-so-sunny New Jersey. Overall costs continue to fall, and larger installations exhibit economies of scale. Installed PV costs in the US, however, are higher than in other countries with the sole exception of Japan. 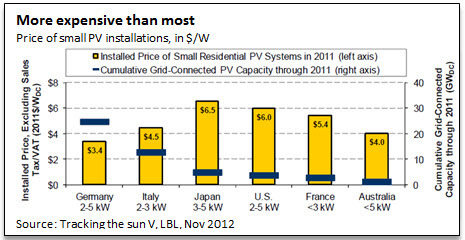 As shown in graph below, price of small PV installations in $/W is nearly twice as expensive in US as in Germany. Perhaps this is partially explained by the large scale of installations in Germany, solid bar with scale on the right. Perhaps US costs will drop with increased penetration. There may be a number of other reasons, further explained in the LBL report. There are significant cost differentials depending on the size of installations, with utility-scale PV projects coming at considerably lower per unit costs, as one would expect. The cost of PV modules has declined considerably and this trend is expected to continue along with improved technology. Overall, the data suggests that there is considerable room for continued improvements, especially on the cost front given the much lower prevailing prices in Germany, where the sun isn’t as bright or prevalent as in many regions of the US.